I also take time in the summer to reconnect with my children who, quite frankly, I spend a lot of time not engaged with from September to June. For the same reason I don’t see my husband, I don’t see my kids. Business travel, networking functions, board obligations — it all adds up, and my kids don’t see their mom enough. Finally, I do it to demonstrate to potential future buyers that my company does not require my participation to run effectively. The systems, the people, the processes are all set up as to not need my hand at the wheel. So how does this relate to sales? It doesn’t. It relates to entrepreneurship. A lot of start-ups have asked me for advice on how to build and run their businesses lately. As someone who built a small business (with a lot of help and some great people) from nothing very quickly, I’m flattered when people ask me how I did it, and as someone who had the support of an incubator (Thanks Eureka Project) and a great mentor (Thanks Gary Brownstone!) I believe strongly in giving back. I met someone here in Mexico yesterday who has been working tirelessly 7 days a week, 16 hours a day to build her business. It was her first vacation in six years, and she wasn’t enjoying it because she was worried about what might be happening to her business at home. I started my business to have freedom and flexibility – I value it more than I value money. You can’t take a lot of three-month summer tours without money, though – so you need good people and decent profit margins. I’m excited for her, taking her first vacation in over six years. I wish her more of that. I wish ALL entrepreneurs more of that. Every summer I post a “summer is no time to relax” blog post – that post is aimed at people who work in sales. This post is aimed at people who are running a business. Your business is not going to love you through the grief of losing a parent. Your business is not going to save your marriage. Your business is not going to improve your health. Your kids are going to grow up before you know it – you have only 18 summers to spend with them, if you’re lucky. As someone who missed the childhood of my first daughter, I don’t want to miss the childhood of my second. I get to make up the time with my oldest now, but I’ll never get back those years. I had a lot of super smart, very successful people talk to me about the value of balance – growth is great, but not at the expense of losing everything you find joy in. Is your business consuming your every waking hour? I loved going to the gym – I woke up one day to realize I hadn’t been to the gym in two years. I was buying expensive, well-tailored clothes to hide the 30 pounds living on the road had packed on, but I was very unhappy. For those of you who are head down this summer, grinding hard – no judgment – I’ve been there, and I was there for a while. But the joy that comes from being able to say “okay” when your teary-eyed six year old says “Mommy, put your phone down” can’t adequately be described in a blog post. You don’t have to go as crazy as a full summer away – a couple of days in the backyard with your laptop tucked away at the office might be a good place for you to start. Me? I confess I still get up at 5 am in the summer and work until my kids roll out of bed at 8. I do a little more work after the little one crashes out at night. They don’t need to know that. My kids don’t care that I won an award, or that we grew x percent last year. The youngest one doesn’t understand that the only reason we can travel all summer is that I own a business. She understands that I got to help her practice her favorite karaoke song and then watch her perform it. It’s “2002” by Anne Marie, by the way. My team has it handled. Empower your team so that you can spend some time doing what you love. 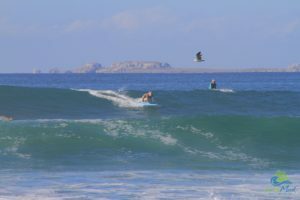 Perhaps you can’t do it this summer, but if you lay the foundation correctly this year, you can join me surfing in Baja next summer. If you’re still shaking your head at the idea that it’s possible may I recommend some summer reading? However you are choosing to spend your summer, I hope you’re enjoying it! I look forward to being back in the office in September, refreshed and ready to do some great things.